Awesome Pokez mural in downtown San Diego. – Cool San Diego Sights! Awesome Pokez mural in downtown San Diego. Here’s another photo of the fantastic mural shown in my previous post. It provides a wider view. 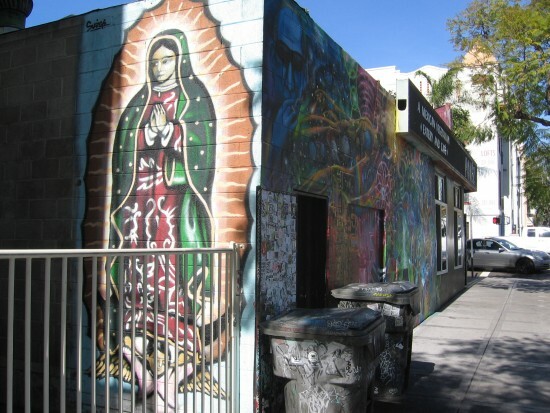 This outstanding example of super cool street art can be found on the outside wall of Pokez, an artsy vegetarian Mexican restaurant in downtown San Diego. The mural’s design is jam-packed with brilliant color, urban style and symbolism, and feels both organic and futuristic. It reminds me somewhat of the spray-painted “space art” you see occasionally being created by street performers in Seaport Village, the Gaslamp, or Balboa Park. Side view of Pokez in downtown San Diego. Previous Previous post: Fantastic street art on wall at Pokez eatery. Next Next post: San Diego Symphony banner adds life downtown.